Hello there! I recently came across Proof Assistants and was really intrigued by them. While these do not hold mainstream attention as of now, most proof assistants are being used to help solve various research problems in mathematics and computer science. Due to their appreciable benefits, I decided to write this post to lightly touch upon two of them - Coq and Isabelle. Finally, we will be writing a very simple proof in both the languages to see them in action. Proof Assistants are software that allow you to translate mathematical proofs into formal proofs which can be then verified by a computer. Therefore, their work extends towards verification of mathematical theorems and an attempt to formalize mathematics. As these proof assistants have compilers which read and accept only a particular style of inputs given to them, it could be argued that they are programming languages. Coq and Isabelle are examples of proof assistants. Without making this explanation too complicated (since I am no expert myself), Coq uses a set of languages (which we will come to later) to understand a proof and verify it. The idea behind Coq and even Isabelle is to be able to break the proof down into some subgoals that each has to be proved. 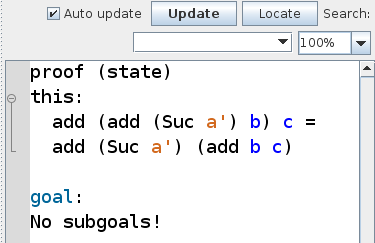 As a result, if each of these subgoals is proved, the end result is that the proof has been verified. I’m assuming you are using some form of Linux, otherwise you may head over here to download it. Again, if you’re not using Linux, head over here. To start up the IDE, run Isabelle2017/Isabelle2017. It will take some time to start up the first time! Gallina: This is used to write down what needs to be proved. Tactics: This aids the writing of the proofs and the commands are always lower-case. Vernacular: This part of Coq handles definitions and they keywords used always start with an upper-case letter. It is also important to note that in Coq every statement ends with a . just like the ; is used to terminate statements in C/C++. This is just a list of very few tactics employed by Coq with some simple explanations behind their functions. Don’t worry if you don’t understand any of these now– It’s just to get an idea of what tactics look like and their functions. While by no means have we studied Coq in-depth, Isabelle is an even tougher nut to crack. I will describe the core syntax of an Isabelle proof below and then we will directly see the Isabelle proof for the theorem we seek to prove today. Again, do not panic if you don’t understand anything. These are more of a reference than anything else. I do not think this warrants much explanation, and we will jump into the proofs straight away. Next, we will go on and prove our theorem first by defining our proof using Gallina and then proving it. We will cover each line of code and see what subgoals remain to be proved for our problem. (add a (add b c)) = (add (add a b) c). Then we use simpl to simplify the expression at hand by using the definition of addition that we had introduced early on. Finally we write Qed (look at Vernacular commands) and prove our theorem! simpl. rewrite -> IHa. reflexivity. The Isabelle theorem follows the same ideas that we incorporated into our Coq proof, but the syntax is a little different. An important thing to remember is that the name of the file (for example, here - “example.thy”) should be the same as what is followed by theory in the first line. Next, we define the proof for addition here as well. Again, we define it recursively and the concept behind it is exactly the same, with the exception of the syntax. "add (Suc f) s = Suc(add f s)"
Now we start our proof. Here we need to define cases for the induction on ‘a’ and proceed with the proof using known logical tools such as reflexivity and simplify. It will be a good exercise to read through the proof and try and figure out that it’s just like the Coq proof. Also, I wouldn’t blame you if you liked Coq more. To me (someone with very little experience in formal logic and proof verification) it seems more intuitive and simpler than Isabelle. lemma addition_associative: "add(add a b) c = add a (add b c)"
With this post, I was hopefully able to interest you enough in the usefulness of proof assistants. Hopefully, you would like to learn more. There’s some excellent Coq (and Isabelle) tutorials out there that you can look up if you’re interested - here, here and here. See you next time!